Are you turning over rocks trying to find unique Halloween costumes to re-create this year? Especially ones that are worthy enough to share on Instagram? 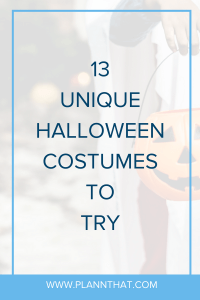 Below you’ll find some fun Halloween costumes, some clever Halloween costumes and even some techy Halloween costumes that we just had to throw in there! Whether you’re an avid Brooklyn Nine-Nine fan or you prefer sitting down with a cup of tea and a biscuit to watch Orange Is The New Black, why not make a unique Halloween costume out of your fav character from a Netflix series. Heck, you could even dress up as a Netflix comedian. Ali Wong Baby Cobra anybody?! Got a fav meme? Why not rock it as a unique Halloween costume this year? Whether you’re going to be sipping tea as Kermit or you’re going to make a dress out of tide pods… you’ll definitely be the life of the party! We have to admit, the team over at Good House Keeping have a pretty flipp’n fantastic list of pun-worthy and unique Halloween costumes that you could try out this year. Haven’t watched American Horror Story yet? ERR MA GERRRD! I freak’n love this series on Netflix so I’d hands down be wanting to dress as a character from one of the many creepy seasons. Personally, I think I’d be opting for a costume from AHS Freak Show or Hotel. What season do YOU like the most? Want to make your friends laugh-react in real life? Why not get creative this year and dress up as your fav social media platform – y’know, get the branding colors down and then print out some of the most iconic ‘things’ about the platform from the past year to glue-gun to the colored clothes. It could be the crazy Instagram makeup trends (if you choose to dress up as the ‘gram) or it could be Facebook’s… erm… privacy issues? PSSST -> Need some help picking out a unique Instagram username? Here are some ideas! I mean… this one is a bit out-of-the-box, but it definitely falls into the category of ‘unique Halloween costumes’ so we’ll take it! Grab a big cardboard box, paint it whatever color you like, and then print off a photo of the uber logo (What is it again? Oh yeah…) and stick it on the front. Add some straps so you can wear the box over your outfit and voila. You’re an uber. Sweet or salty? It’s up to you! 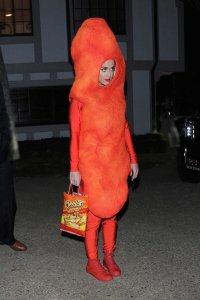 Personally, I’d be aiming to dress up as a giant M&M because my name starts with an ‘M’ and I think that is cleverrrr… but you could also dress up as Katy Perry did as a human-sized cheeto. Fun fact: paint sample cards are free. Stock up on some grey paint samples (make sure you have 50 different shades!) and stick them to a top and voila. You are fifty shades of grey. Got a fav YouTuber (or one you think is worthy of dressing up as THIS Halloween?) well, why not dress up like them this year? Heck, you could even print out a massive screengrab of their YouTube channel and cut out the main channel video rectangle and take that with you to the party so you can stick your face through it to get the message across. Woop Woop! Double points for being crafty. I mean, we swear this blog isn’t sponsored by Netflix. If you’re in a loving couple and want some unique Halloween costumes for both of you, why not have one of you dress up as Netflix (red shirt + Netflix logo stickied on) and Chill (blue shirt + snowflake emoji stickied on). Whether you want to be a questionable eggplant emoji or a laughter-inducing poo emoji… you can make your dreams come true this Halloween! PSSST -> Want to know how you can create some custom Instagram Story graphics for Halloween? Check out this handy dandy blog! Take a cue from Fergie’s book and dress up in frills, lace, sparkles and a big wig for your close up as a child pageant star this Halloween. Whether you want to dress up as the latest iPhone model (ahh, so much to keep up with!) or the iconic Mac computer ‘spinning wheel of death’… you can’t go wrong with these apple-inspired unique Halloween costumes. Wowza! We hope you are feeling super inspired by our massive list of unique Halloween costumes to try. It took us a while to come up with all these lol-worthy ideas for you all, but we think it’s well worth it. I’ve definitely found my Halloween costume for this year, what about you? PSSST -> Do you have an iPhone? Well, since you’re already here, we think you might l-o-v-e being able to plan out your Halloween Instagram posts in advance with our handy-dandy app. Check it out in the app store here!